If you are a pro geek that works in a data center or server farm at a big business, you may need a way to get access directly to your rack without having to get in through another computer. 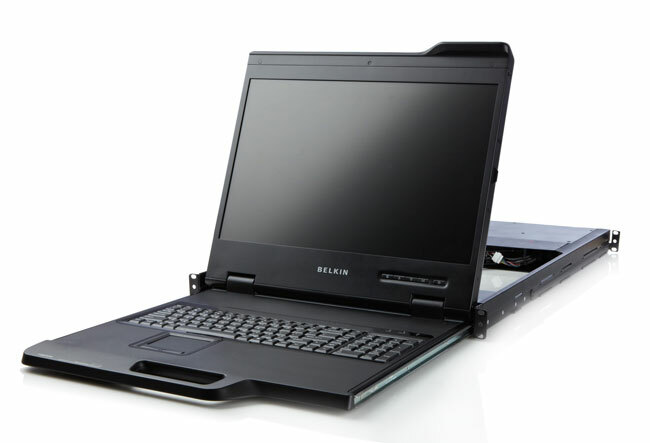 Belkin has unveiled a new product that is exactly for your needs simply called the 19-inch Widescreen Rack Console. The name of the product really says it all. The thing is a rack mount console with a 19-inch widescreen LCD and a keyboard that you can pull out to access the hardware in the rack directly. The screen needs no bracket configuration to mount and has a rail design that is adjustable. The console also has an integrated power supply. It is compatible with standard 19-inch racks, cabinets, and systems. It can be used with an integrated 8 or 16-port KVM option as well. The device also has a touchpad so you have all you need to access your system in one compact unit. Pricing is unknown and the console is available now through Belkin partners.